Inilarawan ng mga sinaunang manunulat ang posibleng paggamit ng isang tulad ng Archimedes screw na tulad na proseso upang patubigan ang mga nakaterasang mga hardin. Estimates based on descriptions of the gardens in ancient sources say the Hanging Gardens would have required a minimum amount of 8,200 gallons (37,000 litres) of water per day. ↑ Finkel (2008) pp. 19–20. ↑ Maureen Carroll, Earthly Paradises: Ancient Gardens in History and Archaeology, (London: British Museum Press, 2003), pp. 26–27 ISBN 0-89236-721-0. ↑ 1. Strabo, ''Geographies'', XVI.1, § 5. Penelope.uchicago.edu. Retrieved on 2011-12-12. ↑ D. W. W. Stevenson (1992). 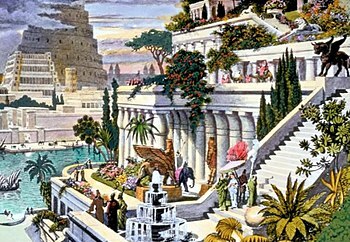 "A Proposal for the Irrigation of the Hanging Gardens of Babylon". Iraq 54: 51. JSTOR 4200351. Huling pagbabago: 04:52, 2 Agosto 2015.